It was a typical weather forecast for an August weekend in Wales: heavy rain followed by light rain, followed by heavy rain. Friday night was a joy, with many of us squeezed into Claire and Alan’s tent at the soggy Llwyn Celyn Bach campsite. No fear of getting reprimanded tonight for making too much noise – the wind and rain would drown out an AC/DC concert. 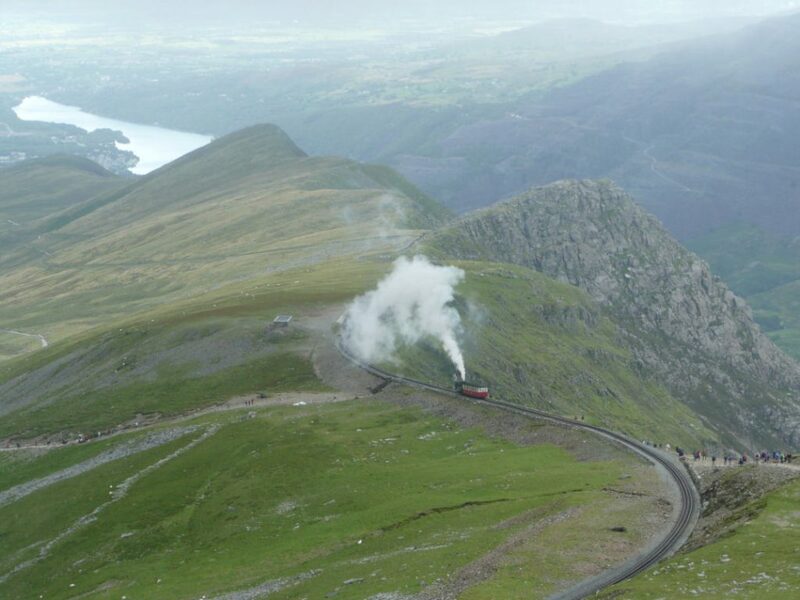 But to our delight, the heavy rain and gales that continued through Friday night cleared by 8.30am on Saturday, so we set off to catch the 9.15am bus from Llanberis to Pen y Pass as planned. Whilst the crowds exiting the bus turned south towards Snowdon, we set off behind the Youth Hostel up onto the Glyders, with hardly a soul to be seen. The views weren’t bad, with the mist clearing every now and then to reveal some stunning mountain scenery. Some of the group ventured on to Glyder Fach for some playful scrambling, following later the rest of the group traversing Glyder Fawr, Y Garn, Foel Goch and Elidir Fawr. For those who did Elidir Fawr, let it be noted we really did not like the knee jerking descent. 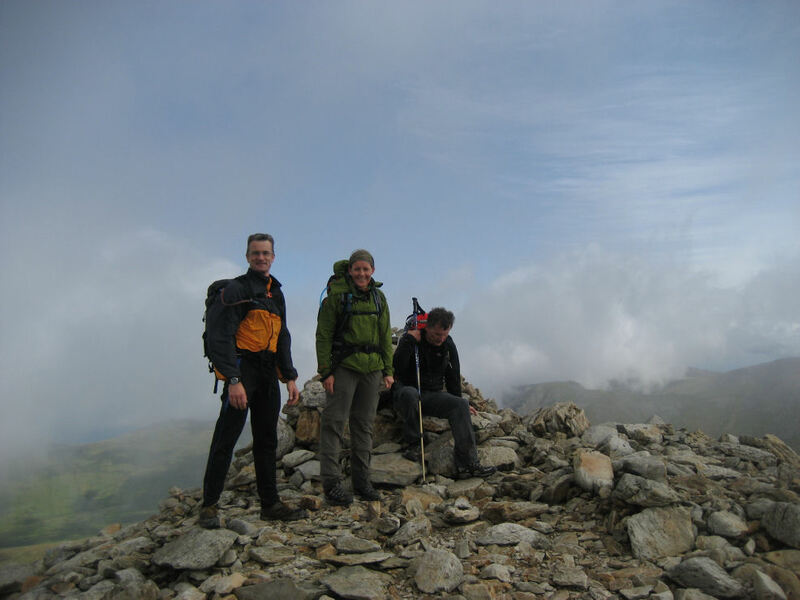 We were concerned that whilst out on the Glyders we had not encountered our brave group of three – Mark, Peter and Andrea – who were attempting the Welsh 15 three thousanders in one day – that’s all 15 peaks over 3,000 feet, a route of 27 miles with 13,000 feet of climbing! After stopping for dinner in the slowest place in Wales (it was an hour before the food even turned up) they set off at 11pm on Friday from the car park in Aber aiming to camp at the first summit Foel Fras. However, the gales and rain got the better of them and so they set up camp at 1.30am just off Drum to get some shelter, so 30 minutes away from Foel Fras. Saturday started off wet, and the planned dawn departure became a 7.30am one. Mark overslept due to jetlag, and there was no caffeine or magic porridge to start the day as Peter forgot to bring a lighter! The 7 peaks of the Carneddau range were completed in good spirits and time and the sun even decided to shine. 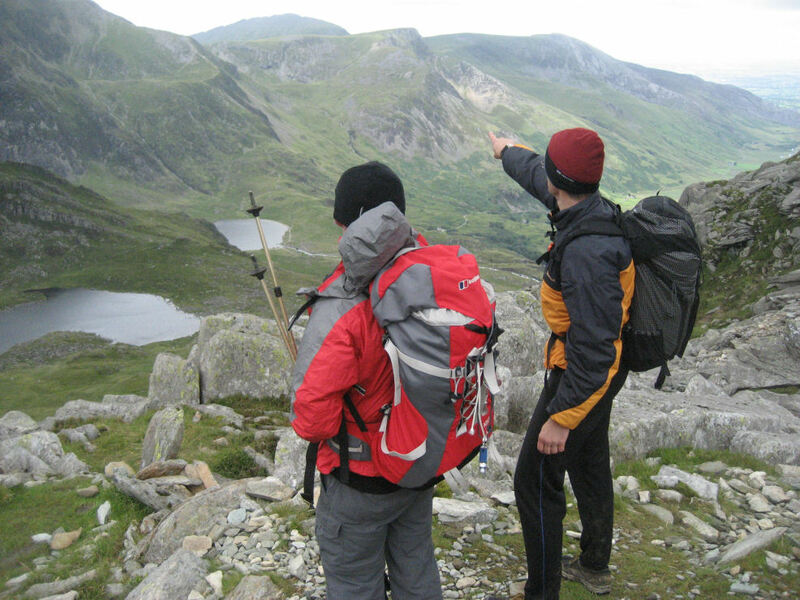 The Glyders range were a bit more challenging especially after a navigational error when ascending Tryfan, resulting in them losing precious time. There were also numerous stops to have a brew once a lighter had been procured. 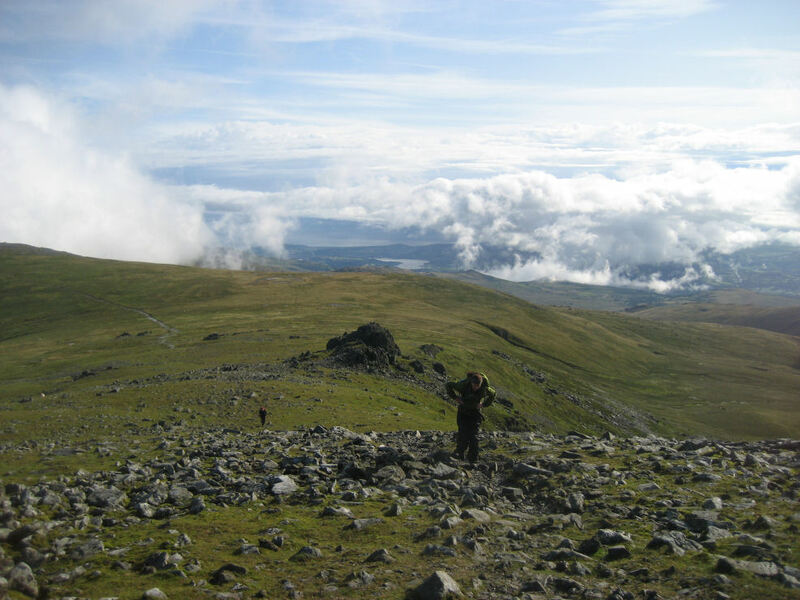 So they completed the 5 Glyders peaks after the rest of us, and the team decided to call it a day and give the Snowdon 3 peaks a miss this time. Crib Goch wasn’t sensible in the dark – though in the dark you wouldn’t see the drop on either side. 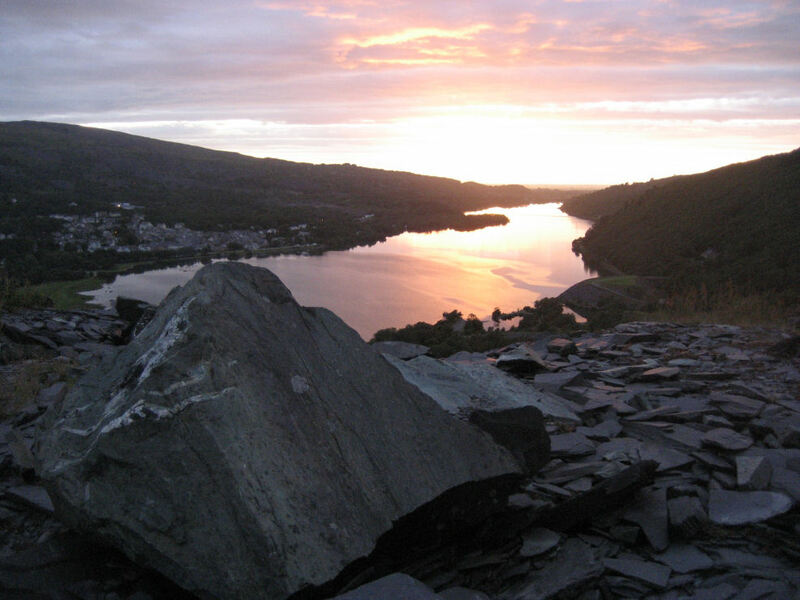 So with blisters and aching bodies, they made the long and tiresome descent of Elidir Fawr, and through the slate mines to join us at the campsite for the big BBQ and plenty of booze. But very well done to them for even setting off in that horrendous weather – and 12 out of 15 ain’t bad! 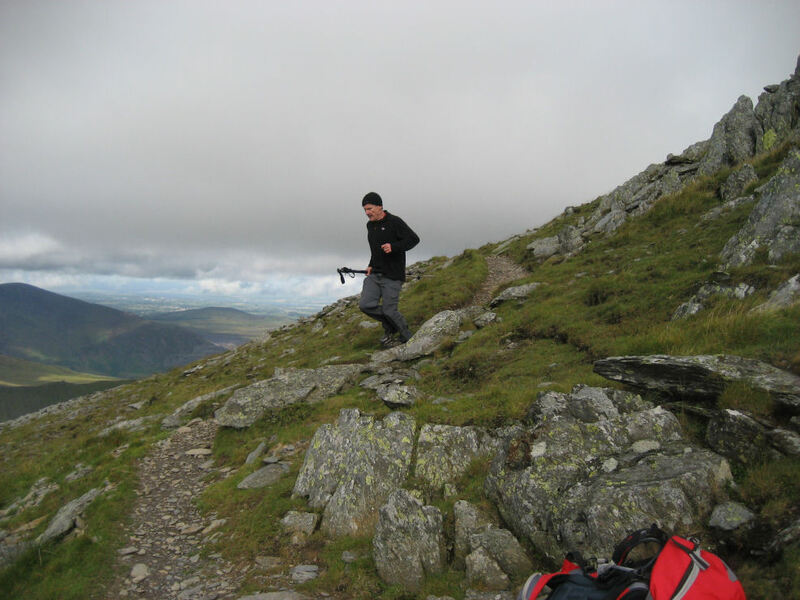 Quote from Mark – “it’s a bloody hard thing to do South to North, and North to South is harder – if we’d camped before midnight on Foel Fras, got up at 5am, not faffed with the stove, we may have made it. No-one said it was easy. Next time.”. Sunday’s weather was also looking hopeful, so Claire, Alan, Catherine, Trudi, Simon, Pam, Martin, Paula and Glenis set off on the same bus again up to Pen y Pass. This time it was a double decker, which when arriving at Pen y Pass was overheating somewhat. Pam and Simon did the Crib Goch route, the rest the Pyg Track, all arriving at the summit at the same time. Despite good views on the ascent, the mist descended over the summit. We squeezed into the new summit cafe (the official opening had been just the day before), and from what we could see through the crowds it looked very impressive and a vast improvement on the old one. We then queued to get a chance to touch the summit cairn, before setting off down the Llanberis track, following the steam trains back to the campsite. Si and Ali went climbing at Clogwyn y tarw/Griben Face near Idwal Cottage, and a special mention to Joanne who with Steve, achieved her goal to climb Snowdon (from the Llanberis path). 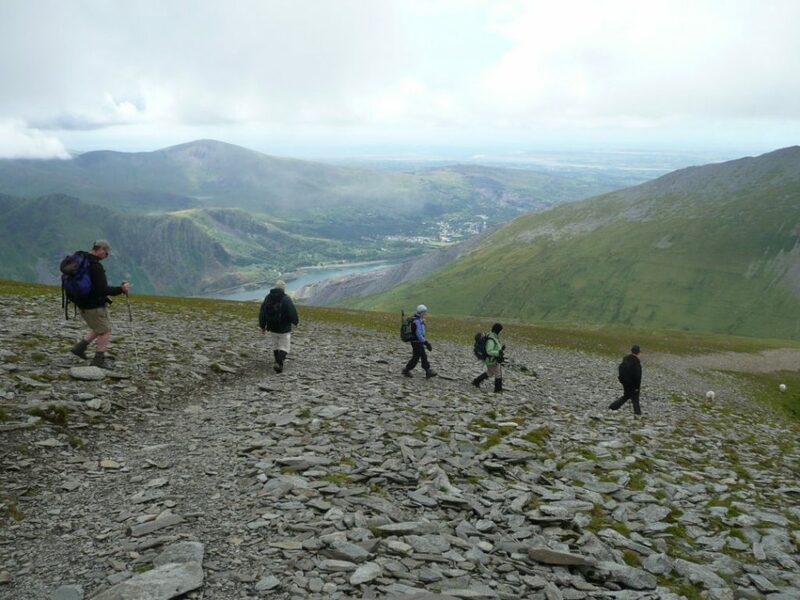 For a number of the group, today was their first ascent of Snowdon. As for Mark, Peter and Andrea, they decided they had had enough of the hills (or maybe some of them were struggling to walk!) and decided on a leisurely and scenic drive home, with a lunch stop in Chester!